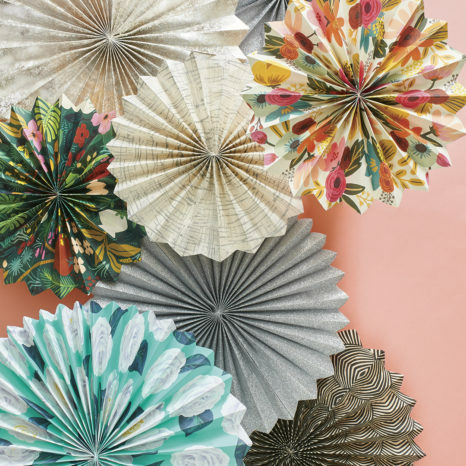 These paper decorations are so easy to make and work wonderfully as party decorations for any event. Use lovely paper rosettes as bridal shower decorations hanging above a serving table or gift table. Hang from tree branches at a summer dinner party or use as wedding decor. Match any theme by using solid color paper or try fun prints, and make multiple sizes for a fun grouping. To personalize, print or rubber stamp a picture, name, monogram or date onto circle labels and attach to the center of each rosette. Make small ones to hang from the back of chairs for seating. For instructions on how to make paper rosettes in multiple colors, click here. Each rosette requires 3 sheets of paper. Accordion fold each sheet of paper lengthwise at 3/4″ intervals (Figure A on the PDF). Take one accordion and adhere the ends of one side by folding it in half. Stick together with super tacky tape (Figure B on the PDF). Repeat for all three accordions. Connect the three accordions together at the remaining exposed edges with tape, forming a circle (Figure C on the PDF). Punch a hole and thread ribbon to hang (Figure D on the PDF).